Do you work in the early years and childcare industry? Would you like to gain more knowledge and understanding of the childcare developments that have been made in the last few years? Then you need to claim your free tickets to one of our early years resources Childcare Expo events. You will discover new resources and ideas, and be able to attend lectures given by some of the leading experts in the childcare industry. Early years resources are always developing and evolving. The recommended ways for delivering childcare and teaching children at a young age is constantly expanding, and new methods are being discovered all the time. When you want to be the best teacher in delivering early years childcare, make the best decision possible and visit a Childcare Expo event, hosted by Broadway Events. Back by popular demand, during 2017, Broadway Events is proud to host the annual three early year resource events. Our events bring all aspects of childcare under one roof; from products to interactive workshops, from seminars with the leading experts to meeting other like-minded early years resource teachers. At our Childcare Expo, there is something for everyone, and as the real sweetener, the events are all free! Register your interest at one of our early years resources 2017 events, and you will be informed when tickets come online for procurement. We are hosting three Childcare Expo events for early years resources 2017. These shows will be happening in London, Manchester and The Midlands, respectively. Below is more information about each event, including details about the location and dates for each event. Our first early years resources 2017 show is taking place in London on the 3rd and 4th March. The London Childcare Expo will be hosted at Olympia Central in Hammersmith, which is accessible via the tube, train, and bus, and there is space for parking. If you are travelling from far away for this event, don’t worry, we have an official arrangement with The Hotel & Conference Company; they will arrange your accommodation at a local hotel close to our venue. There are lots of exciting features that will be taking place during our London early years resource event. We are thrilled to be having over 50 specialist exhibitors and partners contributing to our event, and they will all by showing off a vast array of new products and services. There will be 1000s of products available for your perusal in our dedicated shopping village. The Manchester Childcare Expo regarding early years resources 2017 is happening on 16th and 17th June at EventCity in Phoenix Way. The interactive workshops scheduled have been incredibly popular during past years, and it’s a fantastic opportunity to discover low and no cost activities. Bring your children along to the event and get hands-on in the Snap and Share Zone, and the Make & Create Stage. The date for this early years resources 2017 exhibition will be occurring during the 29th and 30th September, in the Ericsson Exhibition Hall, Ricoh Arena. When you attend this occasion, you will be able to experience all of the activities described above in the London and Manchester occasions, as well as the additional bonus zones scheduled to happen. There will be a Twinkl Inspiration Zone, an Ideas Wall, and, for the third year in a row, an Early Years Breakfast Summit. There are limited spaces to this breakfast, so make sure you register your interest today so you can get tickets before they sell out. If you have been working on an early year resource product that you think should be available to buy on the market, why not fill in our exhibition request form. You will be able to show off your product, chat to the leading authorities in the early years resources industry about your piece of merchandise, and even raise investment for your creation to get it off the ground. 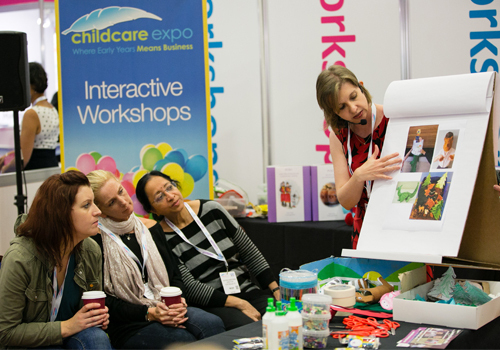 Register your interest today in either the London, Manchester or Midlands Childcare Expo, and you will receive information about when your obtain your free tickets. Discover the most amazing and up-to-date early years resources at a Childcare Expo happening in 2017.